This will become the go to disc for many players. 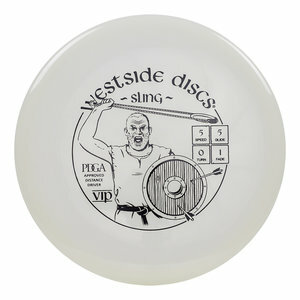 In the same way that a sling propels a rock without much effort, this disc will give easy distance for any arm speed. In testing, the Sling has a very smooth flight on all angles. It won’t matter the midrange shot that you need to execute. Draw the Sling back and confidently execute the shot. Feltryck står Distance Driver på trycket.